Personal Barbecues - Elizabethan Catering Services Ltd.
All our steaks are cut from Grade AAA, Alberta Beef – 0 x 0, which means that they are lean and very good. They are pre-seasoned and we have served tens of thousands of these steaks. They truly are the best steaks that you can buy. We make our own beans, no canned beans for our valued customers!! They are truly delicious and complement all barbecues, perfectly. Vegetarians can also be accommodated with a variety of choices. This is very important, especially in large groups. It is also important with large groups to have alternates, such as salmon and/or chicken, for the guests who don’t eat red meat. We have “tricked up” our past offerings, by researching BBQ menus in North America. As you know, “Down South” is the birthplace of BBQ, and we have incorporated many of their dishes in some of our menu, for those who want to get away from the traditional “Steak and Baked Potato” menu. These menus are unique, and have been received really well. Feel free to mix and match any of the menus to your taste. The menus are popular suggestions for you. We want to create a perfect meal for your special event! Most Barbecues are provided with a Chef, Propane Barbecue, Formally Attired Staff, Chinaware, Cutlery, Glassware, Linens & Meal Service Equipment.. Disposable Tableware is available upon request. Please adivse your Sales Associate of your preference. Thank you. 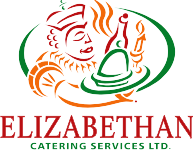 The sizzle is safe with Elizabethan Catering Services!! JAMBALAYA (INCLUDES; SHRIMP, SCALLOPS, SAUSAGE, ONIONS, PEPPERS). FRESH SWEET POTATOES (PREPARED WITH BUTTER, CREAM AND CINNAMON OR OTHER POTATO CHOICE. SEE LIST BELOW. ALL HAMBURGER AND SMOKIE BARBECUES ARE SERVED ON DISPOSABLE TABLEWARE AND BUFFET LINENS ONLY, UNLESS YOU REQUEST OTHERWISE. 8oz. Alberta raised. 28 day age. Suggest not to cook past medium. Low marbling. 8oz. Boneless chicken breast finished on the BBQ. Juicy, tender and full of flavour. 8oz choose oriental tea rub, or lemon ginger marinade. Finished on the BBQ. Quarter chicken can accompany a steak BBQ, or choose the half chicken for a main meat. Finished on the BBQ. everyone loves sausages. Our selection is a perfect accompaniment to a bbq meat. Delicious! Meaty, slow smoked ribs. Half rack to accompany chicken or steak. Full rack as a main. A favourite! A much underestimated meat, so full of flavour, and juicy. Pumped with apple marinade and finished on the bbq. Mouth-wateringly tasty! Pork, beef or chicken. Vacuum tumbled for maximum flavour. 8oz as a main meal. 6oz as a steak accompaniment. Lathered in garlic butter. A true traditional item! 1 1/4lb live Atlantic lobster. Served with garlic butter. Cracker and bibs provided. Chef cooked onsite. Decadence! Alaskan king crab legs. Perfect for a “steak & crab” combo. Melted butter. Pre-cracked. Another truly tasty cut of moist beef. Marinated for 3 days, cooked on BBQ and carved. Incredible flavour! A traditional BBQ feast. Coated in rub, slow smoked and finished on BBQ. Fabulous flavour. Our pulled pork is slow smoked, and it falls apart for the well known and delicious “pork in a bun”! 6oz, 8oz or 12 oz aaa alberta steak. A favourite, every time. 10oz pork chop served with a peach salsa. Go for something different than steak. A winner! Tossed in our signature spices and oven roasted. Our most popular choice. The usual. Served with sour cream, bacon bits and just plain butter. Our fabulous BBQ beans are legendary. Made in house. 20 secret ingredients, one of which is Alberta pinto beans! Skin-on russet potatoes, steamed and mashed with butter, buttermilk and seasoning. Rich texture. Skin-on russet potatoes, steamed and mashed with butter, buttermilk and seasoning. Rich texture. Either plain or with crushed garlic. Potato shells piped with a creamy mashed russet potato, topped with cheese and baked. Sliced zucchini, served in a rich tomato and spiced Provençale sauce. A classic mixture of egg plant and zucchini which always adds a rich enhancement to any buffet. Lightly steamed heads of asparagus, dressed with butter and savoury. Glory-Ann corn on the cob. Year round. Taber corn seasonal in September. Butter and cracked pepper. Thick sliced bread, smothered in garlic butter and baked. A true favourite! Herbed focaccia bread, garlic butter and grilled. Delicious with any BBQ meal! Mini loaves of bakery fresh corn bread. Different than the usual, but truly delicious! Simple, but perfect. Large artisan French sticks, garlic buttered and finished on the grill. Crisp, crunchy and full of flavour. a fresh selection of heritage greens, served with a selection of saskatoon, ranch, italian and vinaigrette. With mixed pastas, olives, peppers, and a creamy dressing with a hint of basil and oregano. diced red potatoes, tossed in a rich house-made dressing. A traditional favourite. a twist on the traditional. A colourful salad with a good flavoured mustard dressing, green beans and red onions. no peanut oils; fine Thai egg noodles tossed in an oriental dressing. Garnished with bean sprouts, celery, peppers. this very flavourful salad has a unique “Persian” taste. the freshness of the chopped parsley, with a hint of mint, makes this traditional favourite outstanding! fresh plum tomatoes with peppers, kalamata olives, and feta cheese, tossed in a Mediterranean dressing. Greece meets Italy! A pasta-based version of the traditional Greek salad. Finely sliced English cucumbers, tossed with onions and served in a rich, creamy dressing. Everyone’s favourite! Sliced, crisp cabbage, garnished with carrot in a homemade dressing. A very flavourful combination of broccoli, bacon, raisins and sunflower seeds. Crispy and crunchy. Carrots, peppers, onions, celery, and cherry tomatoes in a sun-dried tomato dressing. a colorful array of seasonal sliced fresh fruit. Always popular. pastry chef’s choice of desserts, cakes, pastry and square selection. A good variety to meet all tastes!